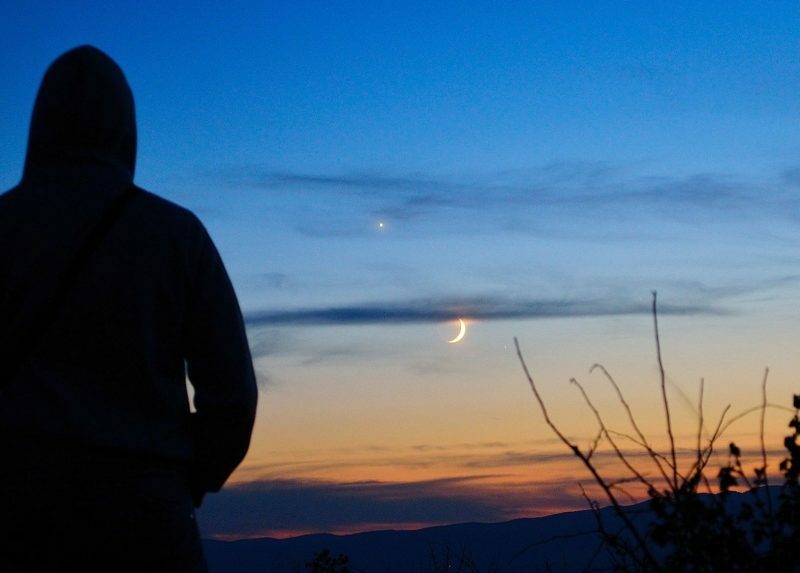 Click the name of a planet to learn more about its visibility in April 2019: Venus, Jupiter, Saturn, Mars and Mercury. A bright waning gibbous moon will be swinging by Jupiter on April 22 and 23, the peak nights of the Lyrid meteor shower. Read more. Jupiter is the second-brightest planet after Venus, and this planet is now rising earlier in our sky, coming into view at late night. Click here for a recommended sky almanac telling you when Jupiter rises into your sky. If you’re up during the predawn hours, you might notice a bright ruddy star in the vicinity of Jupiter on the sky’s dome. That’s Antares, the brightest star in the constellation Scorpius the Scorpion. Although Jupiter shines in the vicinity of Antares all year long, Jupiter can be seen to wander relative to this “fixed” star of the zodiac. Jupiter travels eastward, away from Antares, until April 10, 2019. Then, for a period of four months (April 10 to August 11, 2019), Jupiter actually moves in retrograde (or westward), closing the gap between itself and the star Antares. Midway through this retrograde, Jupiter will reach opposition on June 10, 2019, to shine at its brilliant best for the year. From mid-northern latitudes, Jupiter rises around midnight (midway between sunset and sunrise) at the beginning of the month. By the month’s end, Jupiter rises a couple hours before the midnight hour. From temperate latitudes in the Southern Hemisphere, Jupiter comes up around two hours before midnight at the beginning of the month. By the month’s end, Jupiter rises around 2 1/2 hours after sunset. By early morning, the king planet reigns at the top of a morning lineup of three bright planets. Jupiter sits at top, Saturn in between, and Venus at the bottom. 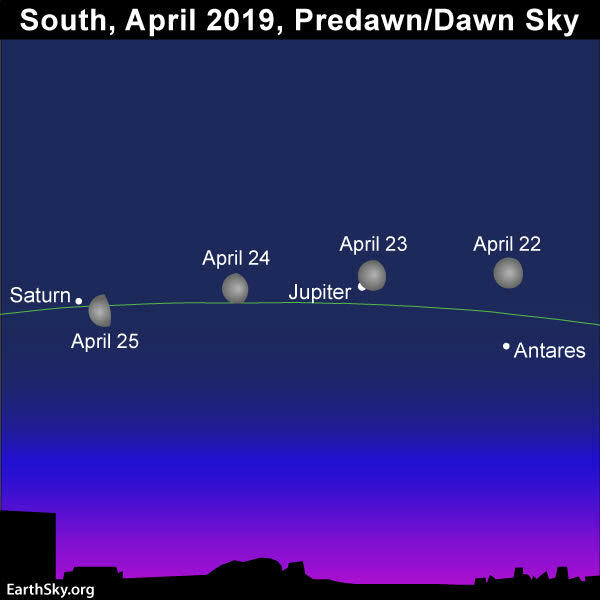 This procession of morning planets finds Jupiter rising first, at late night, followed by Saturn in the wee hours after midnight, and then by Venus near daybreak. Watch for the waning gibbous moon to swing by Jupiter on April 22 and 23, during the peak nights of the Lyrid meteor shower. Saturn comes up up a few hours after Jupiter. Throughout the month, you can view Saturn between the king planet Jupiter and the queen planet Venus as the morning darkness ebbs toward dawn. Day by day throughout April, Saturn and Jupiter climb upward, away from the sunrise (unlike Venus, which is slowly sinking into the dawn). Saturn, although as bright as a 1st-magnitude star, pales in contrast to Venus and Jupiter. From mid-northern latitudes, Saturn rises about two hours after midnight (midway between sunset and sunrise) in early April. By the month’s end, Saturn comes up around the midnight hour (1 a.m. daylight saving time). From temperate latitudes in the Southern Hemisphere, Saturn rises around midnight in early April, and by the month’s end comes up around two hours before the midnight hour. As a reminder, midnight in our usage means midway between sunset and sunrise. 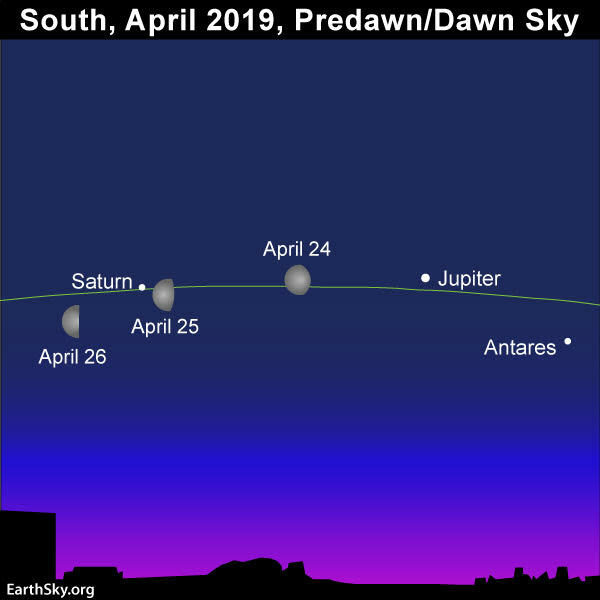 Watch for the waning moon to be in the neighborhood of Saturn for a few days, centered on or near April 25, as shown on the sky chart below. Are you an early riser? Then look for the moon in the vicinity of the planet Saturn for a few days, centered on or near April 25. Read more. Venus is the brightest planet, beaming in the east before sunrise all month long. Watch for the waning crescent moon to join up with Venus in the morning sky for a few days, centered on or near April 1 – and then again on May 1. Venus reached a milestone in the morning sky on January 6, 2019, as this blazing world showcased its greatest elongation from the sun. In other words, on that date, Venus was at a maximum angular distance of 46 degrees west from the sun on our sky’s dome. Ever since, Venus has been slowly but surely sinking sunward. Venus starts out the month at an elongation of 35 degrees west of the sun. It ends the month at 28 degrees west. Despite Venus being the same angular distance from the sun worldwide, Venus spends more time in the morning nighttime sky at more southerly latitudes. In April, at mid-northern latitudes, Venus rises after the beginning of astronomical twilight (dawn’s first light); at temperate latitudes in the Southern Hemisphere, Venus comes up before the advent of astronomical twilight throughout April and May 2019. Click here to find out when astronomical twilight comes to your sky, remembering to check the astronomical twilight box. 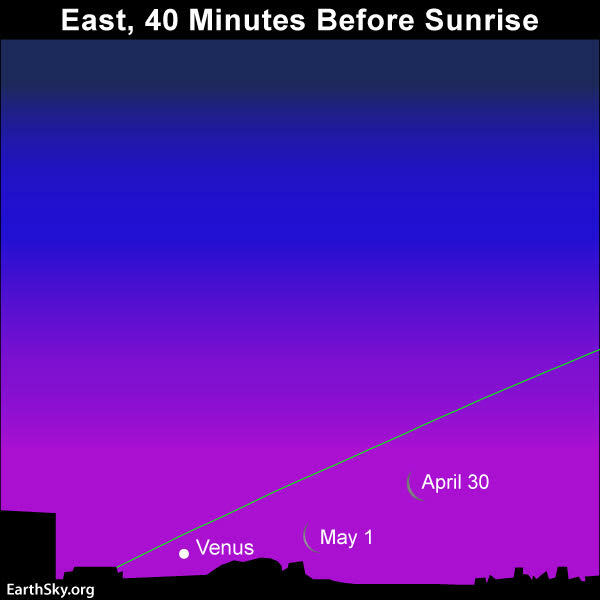 At mid-northern latitudes, Venus rises about 1 1/2 hours before sunrise in early April. By the month’s end, that’ll taper to about an hour. At temperate latitudes in the Southern Hemisphere, Venus rises about 2 1/2 hours before sunup in early April. By the month’s end that’ll decrease to about two hours. At the month’s end and in early May, let the waning crescent moon serve as your guide to the planet Venus. See the sky chart for the morning spectacle below. In late April and early May, seek for the waning crescent moon and the planet Venus at morning dawn. Read more..
Mercury, the innermost planet of the solar system, is in the morning sky all through April 2019. For the Southern Hemisphere, the month of April presents the best morning apparition of Mercury for the year. At northerly latitudes, this is the poorest morning appearance of Mercury for the year. From around the world, Venus shines somewhat close to Mercury on the sky’s dome, so you might be able to use Venus and binoculars to spot Mercury at dawn from northerly latitudes. From the Southern Hemisphere, and the northern tropics, Mercury should be fairly easy to see with the unaided eye. Even from southerly latitudes, it works to your advantage to find an unobstructed horizon in the direction of sunrise for your Mercury quest. At mid-northern latitudes, Mercury struggles to rise as much as one hour before the sun. In contrast, at temperate latitudes in the Southern Hemisphere, Mercury comes up before dawn’s first light (astronomical twilight) all through April 2019. 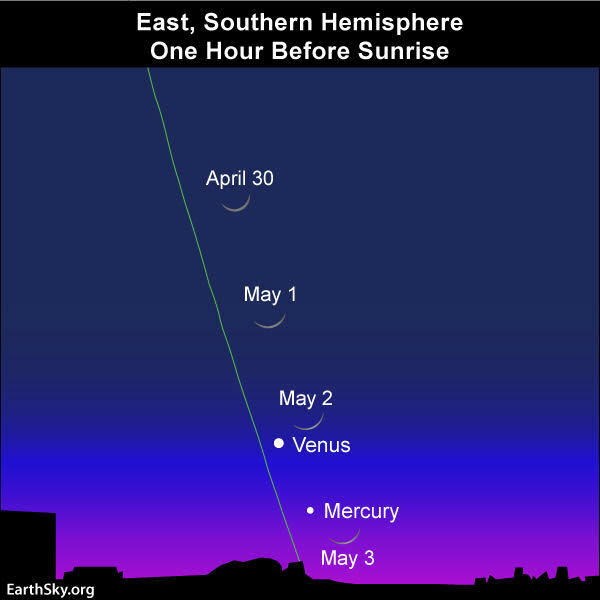 The chart below is for the Southern Hemisphere, where Venus and Mercury are more easily seen in the morning sky. The moon passes close to Mercury on or near April 2, and then again in early May. The Southern Hemisphere has the great big advantage for catching the moon, Venus and Mercury in the morning sky. Read more. Mars is the only bright planet to appear in the April evening sky all month long. “Bright” might be an overstatement, as Mars fades from 1st-magnitude to 2nd-magnitude this month. In other words, before the end of this month, Mars will cease being as bright as the sky’s brightest stars. Still, Mars stays out until after nightfall. You should be able to spot this world in your western sky at nightfall and early evening. Click here for recommended sky almanacs providing you with the setting times for Mars for your location. The good news is that Mars is near the noticeable, dipper-shaped Pleiades star cluster and the bright red star Aldebaran for the first half of April 2019, as shown on the sky chart below. Watch for the young crescent moon to shine in the vicinity of Mars on the evenings of April 8 and 9. The moon’s proximity might offer your best opportunity to catch Mars in the evening sky. Day by day, this planet is slowly but surely fading, and sinking closer to the afterglow of sunset. 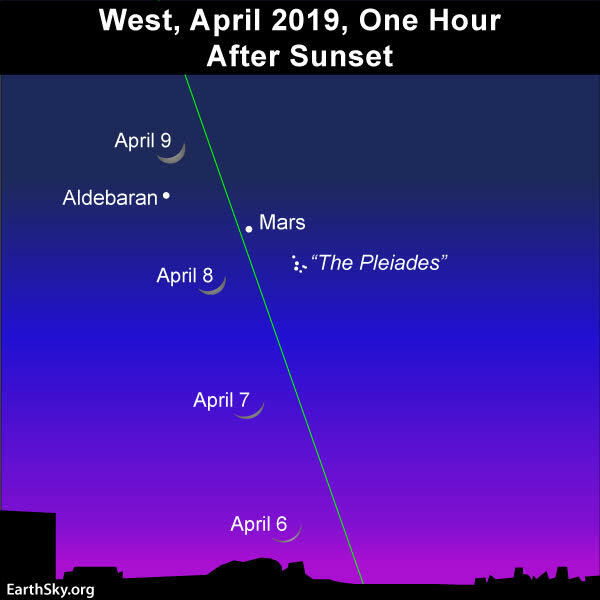 The young moon swings to the south of Mars on April 8 and 9, 2019. Read more. What do we mean by bright planet? By bright planet, we mean any solar system planet that is easily visible without an optical aid and that has been watched by our ancestors since time immemorial. In their outward order from the sun, the five bright planets are Mercury, Venus, Mars, Jupiter and Saturn. These planets actually do appear bright in our sky. They are typically as bright as – or brighter than – the brightest stars. Plus, these relatively nearby worlds tend to shine with a steadier light than the distant, twinkling stars. You can spot them, and come to know them as faithful friends, if you try. Bottom line: In April, Mars shines in the evening sky all month long, whereas Venus, Jupiter and Saturn adorn the morning sky. Mercury appears in the morning sky all month long, but is much easier to view from southerly latitudes. Click here for recommended almanacs; they can help you know when the planets rise and set in your sky. Visit EarthSky’s Best Places to Stargaze, and recommend a place we can all enjoy. Zoom out for worldwide map. 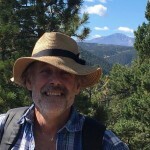 Help EarthSky keep going! Donate now.